There is no shipping cost as this course is delivered online with a coupon access code. Expand your training potential and income by learning how to successfully train in the aquatic environment. This course teaches you program formats that work well in the aquatic environment and exercise techniques for shallow and deep water training. Learn the proper way to monitor and manipulate intensity in the aquatic environment, a skill critical to the success of your client reaching his/her goals. This course is part two of a three course certificate program. 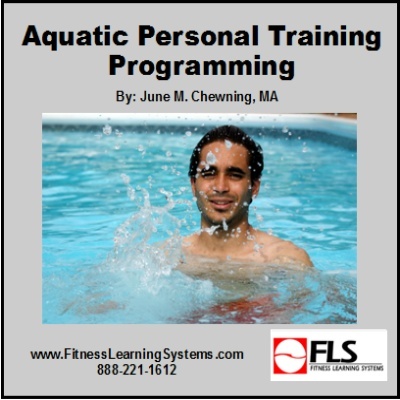 Part one is Introduction to Aquatic Personal Training and part three is Applied Anatomy: Land and Water. Learn how to properly calculate an aquatic target heart rate or zone and properly monitor intensity for cardiorespiratory exercise. Explore ways to monitor intensity for resistance training in the aquatic environment. Understand impact level and speed variation for aquatic exercise. Discover fitness training formats that work well for shallow and deep water exercise. Learn basic principles about deep water exercise including deep water mechanics, neutral buoyancy, vertical positioning, and the difference between symmetrical and asymmetrical deep water exercises.